In a city the size of İstanbul it’s hardly surprising that people can live here for decades and still not have visited every part of it. What is a little more surprising, however, is to stumble on a part of the old city inside the ancient walls that goes virtually unvisited by foreigners. The area around Edirnekapı used to be a bit like that, but these days a growing number of coach parties pass through on their way to visit the Chora Church (Kariye Museum). The part of town around Cerrahpaşa and Haseki, though, is still completely off-the-beaten-track despite being within easy walking distance of Aksaray. Historically, this was a very important part of the city, the place where the old slave market used to stand and thus the place where some of the women who rose to power in the Topkapı Palace harem changed hands on their path to the sultan’s bed. 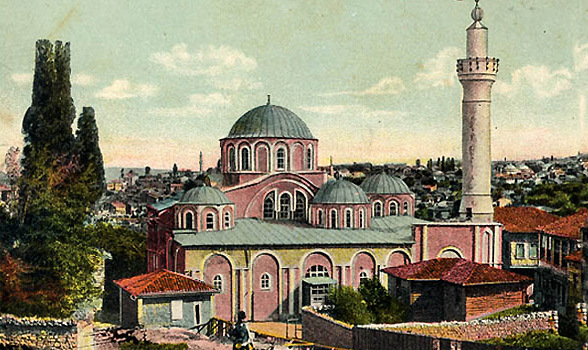 But it was also a part of town picked by several dignitaries of the Ottoman court who chose to adorn it with magnificent mosque complexes, some of them by the great architect Mimar Sinan. To find Cerrahpaşa you need to alight from the tram at Aksaray, cross the busy interchange and look for the 18th-century Ebu Bekir Paşa schoolroom, which now houses a humble teahouse. From there you should head along Namık Kemal Caddesi to find the Cerrahpaşa Cami, which was built in 1593 by Davud Ağa, a pupil of Sinan who succeeded him as chief architect. In the grounds stands the tomb of Cerrah (Surgeon) Paşa, the barber who had the honor of circumcising the future Mehmed III and who was awarded the title of surgeon for his pains. If you continue along Cerrahpaşa Caddesi and then turn left along Haseki Kadın Sokağı you will come to the enormous Bulgur Palas, built in 1912 in the style known as First National Architecture for Mehmed Habib Bey, who made a fortune in cracked wheat (hence the name) and then went on to become a deputy for Bolu. One of the architects who worked on it was Giulio Mongeri, who was also responsible for St. Anthony’s Church on İstiklal Caddesi as well as for the Maçka Palas building that now houses the Park Hyatt Hotel. If, instead, you turn right along Haseki Kadın Sokağı you will come to one of the city’s more curious and easily overlooked monuments, namely the Column of Arcadius, erected in his own honor by the Emperor Arcadius in 402. The column was torn down for safety reasons in 1715, which means that only the base survives, squeezed in between a house and a car park. In winter it’s clearly visible, although at this time of year it’s largely obscured by foliage. Believe it or not, the area around this column where there is now a children’s playground was once the Roman Forum of Arcadius, and then the site of the Avrat Pazarı, or Women’s Slave Market, which survived until 1847. There’s nothing left to show for it today, not even a commemorative plaque, but it’s thought that among the many women to have passed through it were Roxelana, who became the wife of Sultan Süleyman the Magnificent and whose beautiful bath complex in Sultanahmet Square is currently under restoration; Kösem Sultan, the wife of Sultan Ahmed I and, as co-regent for her sons and grandson, one of the most powerful of all Ottoman women; and Mihrişah Sultan, the mother of Sultan Selim III. At the end of Haseki Sultan Sokağı you will come to the Bayrampaşa mosque complex, which is split in two by the road with the mosque on the left-hand side of the road and the medrese (theological seminary) on the right. Bayram Paşa was a grand vizier to Sultan Murad IV, who died during the campaign to recapture Baghdad in 1638 and who gave his name to the area of İstanbul around the Esenler bus station. His tomb is in a very poor state of repair, but a mescid and dervish tekke (lodge) that formed part of the complex now house a women’s clinic. If you turn left onto Haseki Caddesi you will come to the Haseki Hürrem mosque complex, which was built by Sinan for Roxelana in 1539. It’s the third largest such complex in the city after the Fatih and Süleymaniye models, which makes it all the more remarkable that it is so little known or visited. The mosque itself stands on the left-hand side of the road in a cramped courtyard, but the medrese over the road must once have been magnificent, to judge from the delicate tiled panels removed from above its windows and placed in the İstanbul Archeological Museum for safekeeping. Behind it the imaret (soup kitchen) bristles with chimneys alongside a splendid hospital building. Sadly, none of the complex is actually open to the public, and even the mosque seems reluctant to admit visitors. A little bit of zigzagging around the back streets will bring you to the older Davutpaşa Cami, which was built for Davud Paşa, a grand vizier to Sultan Beyazıd II, in 1485 and whose tomb stands right beside it. Across the road, the medrese is one of the oldest in the city but stands in ruins, unlike the Fatih İbrahim Paşa Medresesi, a little way west of Cerrahpaşa Hospital, which was erected in 1560 but badly damaged by an earthquake in 1894. It has just been completely restored (rebuilt might be a better word). Even if you’re starting to feel all mosqued out, it’s still worth heading up Ese Kapısı Sokağı to find the Hekimoğlu Ali Paşa Cami, which was built in 1734-5 in a style that segues neatly from classical Sinanesque into early baroque as exemplified by its main entrance, which blends traditional stalactite decoration with more rococo elements. The mosque itself is particularly beautiful, but you should make sure not to miss either the lovely sebil (water dispensary) built into the walls on the corner, or the wonderful library housed above the main gate. Books here are encased in a cage above the ground and still have to be accessed via a ladder. Another curious reminder of the Byzantine period can be found nearby, and that is the Cistern of St. Mocius, a vast open-air reservoir that may have been used to store water for irrigation in Byzantine times. At 25,000 square meters, it’s big enough to enclose a park and children’s play area. Just look for a monumental hole in the ground, and you’ve found it. Finally, if you continue west along Kocamustafapaşa Caddesi you will come to a busy square where many buses terminate. Here, too, is the inconspicuous Ramazan Efendi Cami, the last work of Sinan, designed in 1586 when he was 96. It contains a fine collection of İznik tiles, although you may only be able to get inside to inspect them around prayer time on Friday.